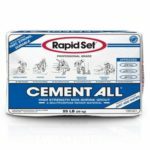 If you want to complete your concrete repairs, remodel and home improvement projects faster and put them into use soon after, use Rapid Set® Cement All®. Cement All is your multipurpose product for general concrete repair, anchoring and grouting, concrete sidewalks and walkways, concrete slabs and floors and decorative concrete work. 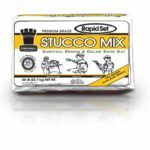 A high-performance blend of Rapid Set® Cement and specialty sand, Cement All is durable in wet environment, sets in 15 minutes and ready for use in one hour. Apply Cement All from feather edge to 4 inches thick. One 55-pound bag yields approximately 0.5 cubic feet. One 25-pound box yields approximately 0.23 cubic feet and one 10-pound box yields approximately 0.1 cubic feet. 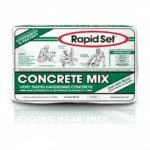 Complete your concrete repairs, remodel and home improvement projects faster with Rapid Set® Concrete Mix. A high-performance blend of Rapid Set® hydraulic cement and quality aggregates, Concrete Mix is your multipurpose, workable and fast-setting product for general concrete repair, anchoring and grouting, concrete sidewalks and walkways, concrete slabs and floors and decorative concrete work. Concrete Mix is durable in wet environments, sets in 15 minutes and ready for use in 1 hour. Apply Concrete Mix from 2 inches to 24 inches thick. One 60-pound bag yields approximately 0.5 cubic feet. 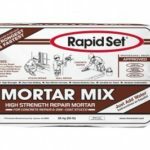 Finish your concrete repairs, remodel and home improvement projects faster with Rapid Set® Mortar Mix. A high-performance blend of Rapid Set® hydraulic cement and quality sand, Mortar Mix is your multipurpose, workable and fast-setting product for general concrete repair, anchoring and grouting, concrete sidewalks and walkways, concrete slabs and floors and decorative concrete work. Mortar Mix is durable in wet environments, sets in 15 minutes and ready for use in 1 hour. Apply Mortar Mix from ½ inch to 6 inches thick. One 55-pound bag yields approximately 0.5 cubic feet. One 25-pound box yields approximately 0.23 cubic feet. Use for exterior plastering applications where accelerated set times, higher strength, superior durability, minimal shrinkage and reduced cracking are desired, Stucco Mix is a premium blend of Rapid Set® Cement, quality plaster sand and high-performance additives. Comparable in appearance to portland cement plaster, apply Stucco Mix using similar methods. Save time by scratching, browning (or applying in one coat to ¾ inch), and color coating in one day. One 50-pound bag covers approximately 7.0 square feet at ¾-inch thick. Use Rapid Set® Skim Coat to save time and easily repair, level and smooth concrete substrates prior to the installation of floor coverings. Skim Coat is used for floor underlayments, concrete repairs, patching and skim coating. It is a high bond strength, fast-curing, smooth (unsanded), hydraulic cement-based material for use on interior and exterior projects. Skim Coat has excellent bond strength and is resistant to mold and mildew. No primer or curing compound is necessary. Apply and finish from featheredge to 1-inch deep. Top with flooring such as VCT, sheet vinyl, carpet, tile, pavers within 1 hour and with an epoxy in 16 hours. One 20-pound bag has skim coat coverage of 66.6 square feet at 1/8-inch deep or 33.4 square feet at ¼-inch deep. Choose Rapid Set® TRU® Gray Self-Leveling when you need a high quality, fast, polish-able, cement gray topping. TRU Gray is a high performance, architectural topping and resurfacer that can be used indoors and outdoors, in wet or dry environments. It is ideal for projects that need long flow life and working time while achieving high early strength. A customized appearance can be achieved by adding decorative aggregate. 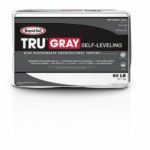 TRU Gray rapidly levels, maintains workability for 20 minutes, and produces a smooth, strong surface with high-bond strength. Save time since TRU Gray is ready for foot traffic in 2 to 3 hours; for coatings in about 12 hours; and grinding and polishing in 24 hours. TRU Gray grinds and polishes much like concrete and can achieve a very high gloss and Distinctness-of-Image (DOI) due to its high density and low polymer content. For flat surfaces, one 50-pound bag covers 15-16 square feet at 3/8-inch thick.